I have been the WORST blogger! I can’t believe how few times I’ve posted in the last while. To be fair, I do have a needy three year old with chicken pox but still… Anyway, I am going to include a few items in this post, not my usual style but why not!? This was for a swap requiring a girl or woman on the ATC. 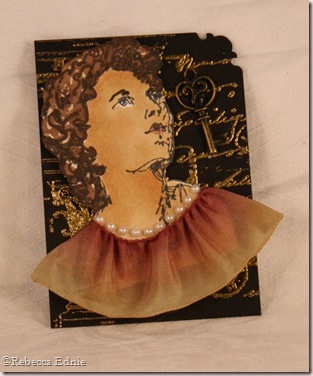 I used a an architectural stamp and a script stamp for the background and embossed them with gold powder. The girl was stamped and Copic coloured’; I deliberately made her with medium skin so her race was indeterminate. The pearls were a strand that were already glued together, how fun and easy! The ‘dress’ is ombre ribbon I’ve had forever, I’m glad I finally have a use for it. I paper pieced Mickey’s face and eyes, colouring in his tongue. The embossing was done with a powder painting technique where you pour on one colour of powder, flick it off and then pour on another. I thought it really suited the razzle dazzle that is all things Disney! 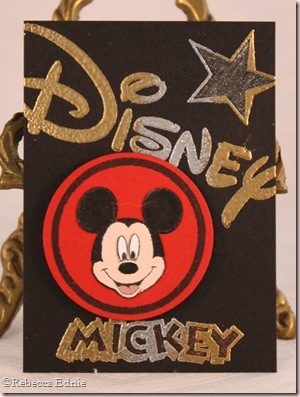 I coloured in the star and Mickey word with Spica pen, then wished I hadn’t. Oh well! 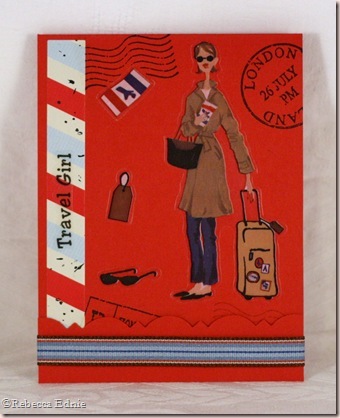 I made this Post-It note cover for my sister who loves to travel. I made it thin enough to put in a purse. Normally I make these 1/4” thick but this one is just 1/8” thick. I made one similar for me and it fits in the pocket of my Bible’s leather cover. This one uses stickers from Making Memories and I’m not sure of the girl ones plus some stamps I’ve had for ages. I didn’t add a tie to the ribbon because I was keeping down the bulk and I was concerned about fraying.